We’ve all seen the power of technology to affect change in classrooms and communities around the globe. Here at Daily Edventures, we’ve explored many ways technology has improved the lives of students – by connecting them to big ideas and new experiences. But for Robin Pettyfer, technology also has the potential to change the future course of mankind. Pettyfer, whose father was a British military officer and whose mother was a prisoner of war, recalls thinking about his mission in life – to bring people together – as a five-year-old. He committed to that mission at a very young age, ultimately living on multiple continents, learning languages and studying law and journalism as a means to make that mission a reality. Pettyfer left his home in Canada and a promising journalism career in 2006 to pursue his dream. When he arrived in the Philippines, Pettyfer envisioned linking people through technology to talk about issues that matter, leading to better understanding, and ultimately, a more secure future. U sing videoconferencing, Pettyfer’s PeaceTech organization has connected people from all walks of life to discuss poverty and security, discrimination and hatred, and the impact of wars on everyday life. In the Philippines and neighboring Indonesia, PeaceTech has brought together Christians and Muslims, radical Muslims and moderate Muslims, rich and poor. It has highlighted the problems facing women and children, and prompted change in many war-torn communities. 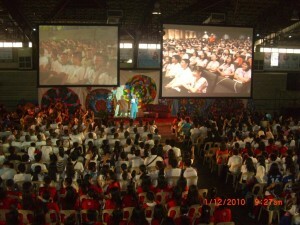 Throughout the organization’s history, students have played a critical role. 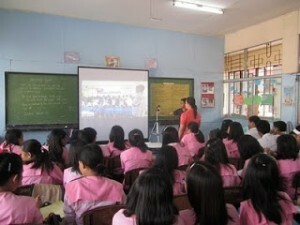 Pettyfer has brought Skype into classrooms in conflict areas with daily videoconferencing classes impacting thousands. The sessions focus on fostering understanding, and PeaceTech’s YouTube channel features a number of videos that provide a fascinating window into these discussions. Over 100 teachers in 32 schools have been trained to be facilitators, with more coming. This work has even captured the attention of the Philippines Department of Education, which is now working to integrate PeaceTech’s methods into subjects like English and History. If you’d like to get your classroom involved, or to help support the mission of this incredible organization, please visit their website at www.Peacetech.net. Enjoy today’s Daily Edventure with Robin Pettyfer. This entry was posted in 21st century skills, Beyond the Classroom, Entrepreneurship, External Videos, Information, People, Student Voice, Virtual Learning Environments. Bookmark the permalink.